If you want your Web site or page to rank highly in Google searches, here are three free things you can do to improve your ranking, also known as as SEO or Search Engine Optimization. In general, put yourself in the minds of people searching and tailor your Web site or page to those searches. Be truthful! After improving your Web site or page, you may have to wait a few days until Google’s robots find your website and update their indexes. This does not happen instantaneously! Your website may change immediately but Google’s search engine rankings do not. Be patient. (1) What keywords are searchers using? Put those keywords into your metadata, headlines, and top paragraph. For example, if you are offering “photography lessons in Delaware,” use those three keywords in the title and description metadata, and in the headline and first paragraph. I did this and my page is ranked #1 for people searching for photography lessons in Delaware. (2) Do research! If you use certain keywords in a search, what sites get top ranking? Study those sites, see what they are doing right, then emulate them. In particular, look at the metadata title and description of each website as shown in Google’s search listings. If you are really ambitious, you can look at the source code. Also look at their content. What are they offering that you are not? (3) Google is about giving people links to information. If your Web site or page has links to valuable information, then your page will probably rank higher. For example, if you want people searching for photography lessons in Delaware to find your page, then you should give them links to many photography lessons in Delaware; that is, give them links to all your competitors! This is a “Miracle on 34th Street” strategy and it works. In general, try to serve visitors and not yourself. “Put the client first!” is an old mantra for business, and it applies to Web sites and pages as well. Stop pushing yourself and start offering visitors what they are searching for. Love God and your neighbor. 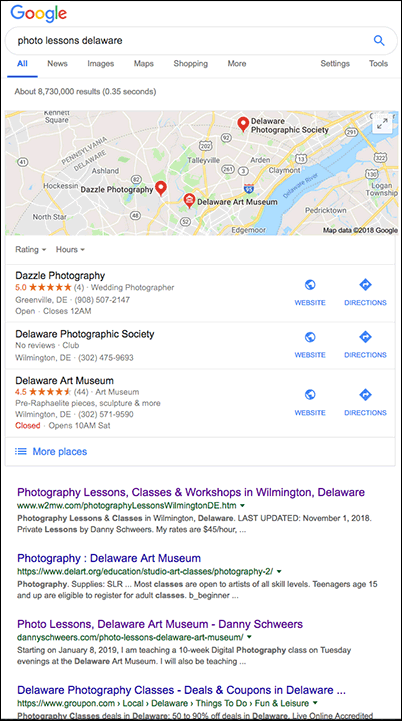 ABOVE RIGHT: Google search results for “photo lessons delaware” on 11/30/2018. Here are some Web sites with lots of information, sometimes too much. Use at your own risk!